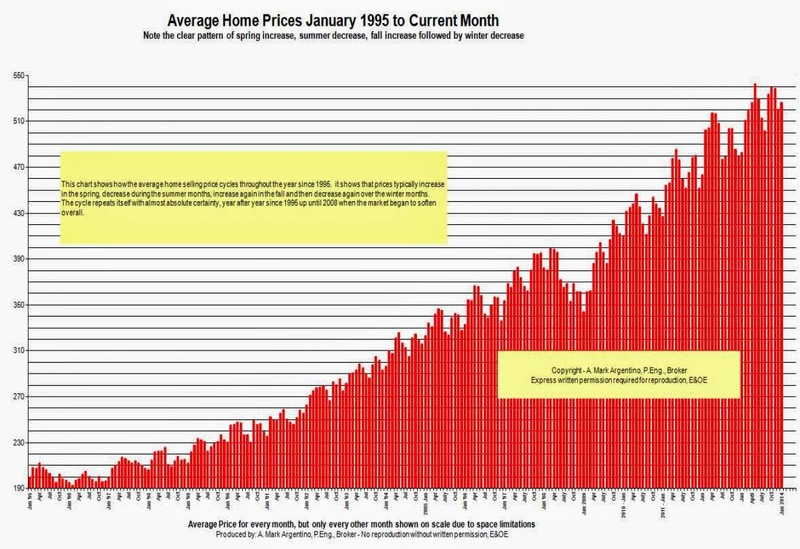 One question regarding the cyclical pricing.. it looks from your graph http://www.mississauga4sale.com/avgprice1995todate.jpg that the peak is typically in the April or May months. Can you tell me whether that represents closing date, conditional sale date, listing date or something else? Trying to strategize our sale timing since we're a bit flexible. The peak of the market price is typically between the months of April and May of each year. 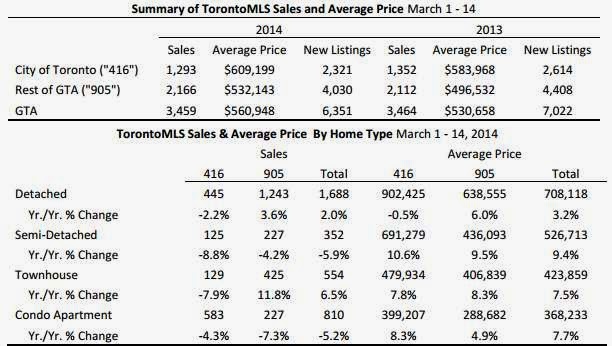 This represents the sale price reported on TREB for that particular month. It does not account for conditional sales or the closing date, only the firm sale price that occurred during that particular month. If, for example, a conditional sale was put together on April 5 and firmed up April 12th, the sale price would go towards April average. If a conditional sale was put together on April 25 and firmed up May 3rd, the sale price would go towards May average. Best time to list is typically a week or two after the March break, then it takes 1-3 weeks to sell and you would sell at or near maximum and close typically about 3 months later. Most people like to close end of June or end of July due to children finishing school, and since most closings are between 60-90 days, this is another major reason that contributes to the March, April and May peak selling period. Part of my job as your realtor is to keep you informed and help you make the best decisions for yourself. Of course, saving money is paramount, so…. I wanted you to know about changes that will make it more expensive for anyone buying a home with less than 20% down payment. In Canada, lenders typically require Buyers with less than a 20% downpayment to pay for mortgage insurance, offered by the Canada Mortgage and Housing Corporation (CMHC). The size of the premium is calculated as a percentage of the mortgage and based on the amount of the downpayment - the higher the downpayment, the lower the premium. On Friday February 28th, CMHC announced that they are increasing CMHC premiums as of May 1st, 2014. For a $250,000 mortgage, a Buyer with 5% down will now be paying an additional $1,000. For a $450,000 mortgage, a Buyer with 5% down will now be paying an additional $$1,800. For a $250,000 mortgage, a Buyer with 15% down will be paying an additional $125. The higher your downpayment, the less CMHC insurance premium you will have to pay. To avoid the increased fee, make sure that your lender submits a request for CMHC insurance for you prior to May 1, 2014. The closing date on your new home is irrelevant, but you'll need to have an Agreement of Purchase and Sale in place and have your mortgage in process by May 1, 2014. What am I really saying? If you have a 5% downpayment and want to save a couple of thousand dollars, buy a home before May 1st. If you are an owner of a condominium townhouse or a high-rise condominium, you too want to make sure that your insurance on your investment property is active. The reason you need insurance is because the tenants package only covers the tenants contents and the condo insurance typically only covers to middle of the exterior walls. As an owner, you need insurance to cover your appliances, flooring, walls, drywall, cabinets, bathrooms etc. in the event of a loss. Also, if your loss in your unit or property creates a loss in other units adjacent to your unit then you need insurance for that too. This can get very expensive. If you are a tenant, you need to read this below! I recently heard that a small fire this past New Years' Eve in the bedroom of a condominium townhouse created a huge personal and financial loss for the tenant living in the property. The reason for the loss was the tenants insurance policy had expired and the tenant did not renew the insurance for another year because the tenant wanted to save about $225. This tenant is now out of pocket over $25000, had to move somewhere temporary for 3 months which cost additional money and the tenant lost all her belongings and furniture due to this oversight! This email is not meant to scare you, it's a friendly reminder for you. If you are a tenant you must confirm that your insurance policy is currently active and keep your tenants package for your personal property and legal liability insurance policy in full force and active. If there is a fire or flood and you lose some or all of your belongings you need your own insurance coverage and policy. Also, if you cause the fire or flood and if this loss creates damage or a loss in other units or properties adjacent to your unit or property then you need insurance for that too. This can get very expensive. Please verify your insurance policy is active and that you have a tenants insurance package that covers your contents and at least $1million liability insurance that is current and active.